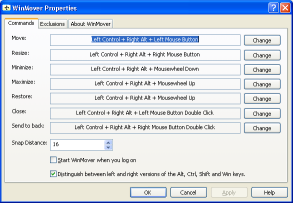 With the configuration program for WinMover, you can change what commands you want to use to move windows. You can move a window by clicking anywhere in it and dragging. You can resize a window by clicking anywhere in it and dragging. The corner that you clicked closest to will be used for the resizing.